« I Know That Place!!! 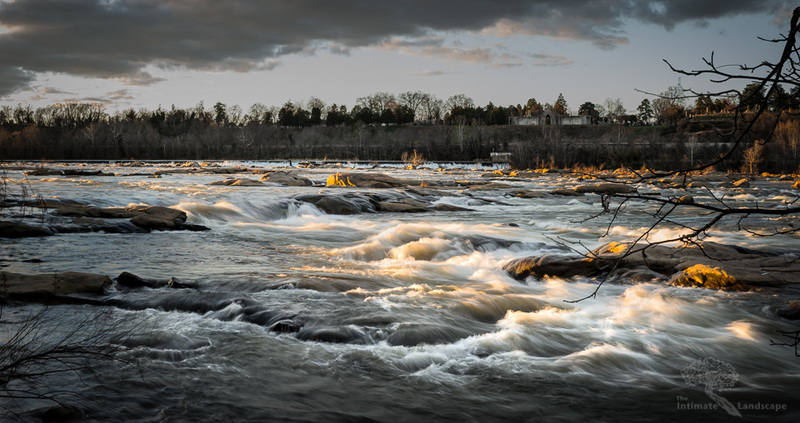 Sunset casts its warm glow on the rapids of the James River near downtown Richmond, Virginia. I had the opportunity to be in Richmond for a bit a few days ago and made a point to head down to the river (camera in hand, of course). The light at sunset was wonderful; the location of the sunset at this time of year puts it in the perfect position to skim across the rapids at just the right angle to sidelight the rapids. Combined with slightly elevated water levels thanks to some recent rains, and I was blessed with quite a scene. I shot this scene from several angles, starting closer to the river at a lower angle and eventually moving up the bank to a higher position which gave me a better view of the rapids and increased the contrast between the whitecaps and the flowing river. This is another multi-image composite, 2 rows of 6 vertical images each. However I cropped a good bit of the sky out of the final composite as the clouds did not add anything to the composition. Taken with a Nikon D800 and a Sigma 50mm f/1.4 Art lens at f/16 using ISO 100. A 1/3-stop neutral density filter was used to get the shutter speed down to 1/4 of a second. The final image is just under 70 megapixels in size. This entry was posted in James River, Landscape Photography and tagged composite, James River, Richmond Area, river, water.